Research Areas and Research Platforms are interdisciplinary units with up to 60 habilitated researchers established around a specific research topic. Research Centers are considerably smaller but also bring together highly qualified researchers to work on a common research topic. 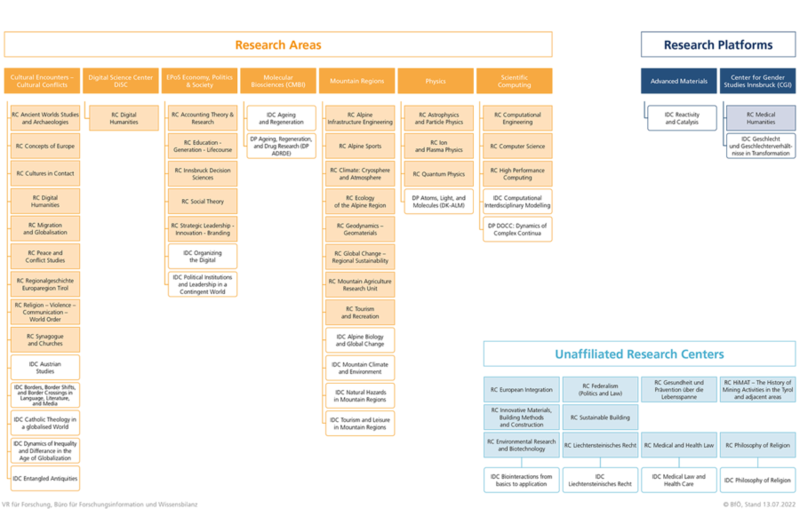 Researchers organized in the Research Area System are responsible for 85% of all publications in the Web of Science and 75% of all research grants. After the evaluation speakers of all units present their research results and future research plans at the so called ‘Zukunftsplattform Obergurgl’. A doctoral programme is a unit formed by several scientists or scholars whose research is of an internationally leading standard. Doctoral candidates are offerd a structured educational program, are integrated in the research process and will spend some time abroad. All Research Areas and Research Platforms aim to establish at least one Doctoral programme. For further information concerning the research system or doctoral programmes please contact Friedrich Gaigg.